Knee pain exercises are one of the best things you can do to reduce pain, weakness, stiffness and swelling at the knee. By strengthening and stretching the muscles around the knee, you can reduce the forces going through the joint and improve the stability. Most cases of knee pain respond well to exercises. But it can be hard to know where to start. Here we will look at some great beginners level leg exercises to get you started. These knee pain exercises are generally suitable in the early stages following an injury or surgery, for anyone suffering from knee stiffness or for those people who are just starting out with knee exercises. They get the knee moving and start strengthening the muscles without putting much force through the joint itself. 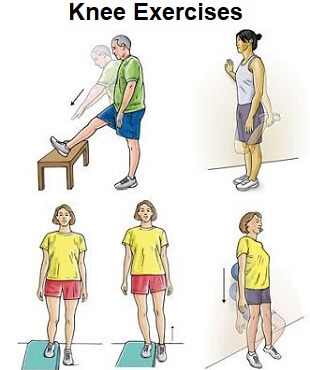 Once you are happy with these exercises, you can progress onto intermediate and then advanced knee pain exercises. Knee pain exercises should feel challenging but not painful. See the Top Tips on Exercising section before you start to get the most out of these knee pain exercises. With any knee problem, you should always see your doctor before you begin exercising, but once you get the all clear, you’re ready to go. Progression: Add a weight e.g. by wearing a shoe or using an ankle weight. Adaptations: To make the exercise easier: 1) Push up through you arms 2) Use a higher chair. Choose the knee pain exercises that work best for you. You don't need to do all of them, pick the three or four that feel right for you. Remember, they should be moderately challenging but not painful. Visit the Knee Exercise overview for tips on working at the right level for you and getting the most out of your exercises. Once you have done these knee pain exercises for a few weeks, you should have built up the number of repetitions of each exercise and they should be starting to feel quite easy. When that is the case, CONGRATULATIONS! You are ready to progress on to the intermediate and then advanced knee pain exercises to help build up more strength and flexibility.